MANILA, Philippines – The February 2019 Mechanical Engineer (ME) and Certified Plant Mechanics (CPM) board exam results to include the list of passers, topnotchers (top 10), top performing schools and performance of schools are released online today, February 28 or in three (3) working days after the exam. As announced, 1,538 out of 3,046 (50.49%) passed the ME Licensure Examination and 31 out of 87 (35.63%) passed the CPM board exam. The Professional Regulation Commission (PRC) and the Board of Mechanical Engineering administered the licensure exam in the cities of Manila, Baguio, Cebu and Tacloban on February 24 and 25. From March 8 to March 14, 2019, registration for the issuance of Professional Identification Card (ID) and Certificate of Registration will be done on-line. Please go to online.prc.gov.ph and follow instructions for initial registration. Mechanical Engineering board exam verification of ratings (passers, non-passers and removal) can be done online. Visit PRC's "Verification of Rating" service and enter the required information to verify your identity. Note that this can be available in few days after the exam. Examinations for ME board exam covered the following major subjects: industrial and power plant engineering (Day 1); mathematics, engineering economics and basic engineering services, machine design, materials and shop practice (Day 2). Meanwhile, CPM exams covered the following: elements of power plant machinery, shop machinery practice (Day 1) and elements of industrial plant machinery (Day 2). According to PRC Resolution No. 1127, the target release of Mechanical Engineer board exam results is on Thursday, February 28 or in three (3) working days after the exam. However, results may be released ahead of the target or in later date without prior notice. In the same period last year, results were released online in 3 working days. A total of 933 out of 1,983 passed the Mechanical Engineer Licensure Examination and 20 out of 44 passed the Certified Plant Mechanic Licensure Examination. In the March 2017 licensure exams, 1,083 out of 1,904 successfully hurdled the ME board while 19 out of 39 passed CPM board exams. The Summit Express will update this page immediately for the list of passers, topnotchers and performance of schools once results are out online. 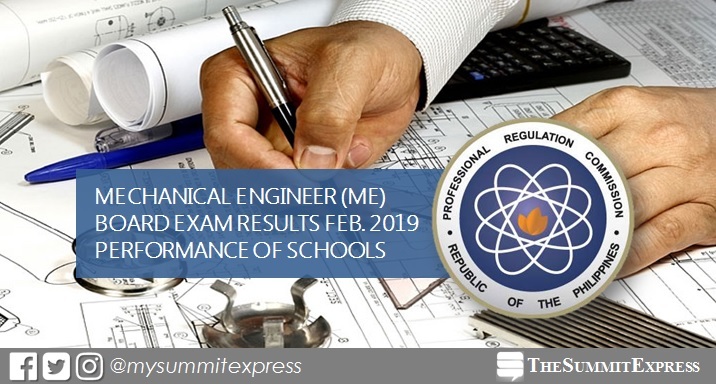 MANILA, Philippines – The Professional Regulation Commission (PRC) hailed the top performing schools in the February 2019 Mechanical Engineering (ME) and Certified Plant Mechanics (CPM) board exam. PRC conducted the licensure exam in the cities of Manila, Baguio, Cagayan De Oro, Cebu, Davao and Lucena on February 24 and 25. In the same period last year, Batangas State University (BatSU) - Alangilan was the lone top performing school with 99.15% or 117 out of 118 passed the exams. BatSU - Alangilan also led the schools in the March 2017 exams with 100.00% or 66 of its takers successfully hurdled the exams. BatSU- Batangas City ranked second with 98.51%, 66 out 67 passed the exams. Mapua Institute of Technology (MIT) - Manila was on third spot with 97.26% or 71 out of 73 passed. Monitor this page for the real-time updates on ME and CPM board exam results. Check out also the official website of PRC for more information. MANILA, Philippines – ME BOARD EXAM RESULT. 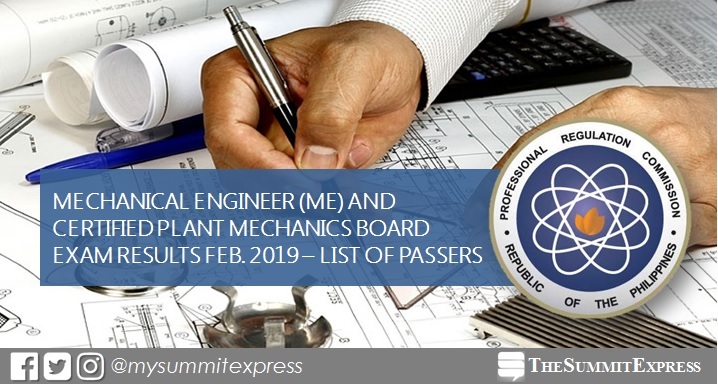 The full list of topnotchers or top 10 passers in the February 2019 Mechanical Engineer (ME) and Certified Plant Mechanics (CPM) board exam is available on this page as officially released Thursday, February 28 or in three (3) working days after the exam. The Professional Regulation Commission (PRC) recognizes the highest placers for February 24 and 25 Mechanical Engineer board exam, which was conducted in various testing centers nationwide: Manila, Baguio, Cebu and Tacloban. In the same period last year, Kelvin Mendoza Macatangay of Batangas State University (BatSU) - Alangilan aced the board with 88.75%. It was followed by Kyle Darryl Tan Aguilar of De La Salle University (DLSU) - Manila with 88.35%. In the March 2017 exams, Brylle Pahimutang Gilbuena of University of Cebu in Lapulapu and Mandaue led the topnotchers with 88.10%. Nino Rey Jacoba Caraig of Polytechnic University of the Philippines (PUP) - Maragondon ranked second with 87.80%. The Summit Express will update this page immediately for the list of topnotchers once released online. MANILA, Philippines – Solicitor General Jose Calida expressed his opposition against the salary increase of government nurses. The solicitor general told the Supreme Court that there is “no legal basis” to grant the petition of Ang Nars Party-list to raise the wages of nurses to Salary Grade 15. Following the oral arguments in the Supreme Court to discuss the petition, Calida said that the provision cited by the group had been repealed in 2009 by a joint resolution by Congress. He further added granting the petition would only lead to wage distortion. Ang Nars Party-list cited section 32 of Republic Act 9173 or the Philippine Nursing Act of 2002 as their legal basis as it mandates the government that the minimum base pay of nurses in public health institutions shall not be lower than Salary Grade 15. However, Joint Resolution No. 4 repealed all provisions of laws prescribing salary grades for government officials and employees other than those in the Compensation and Position Classification Act of 1989. Under the Compensation and Position Classification Act of 1989, it set the SG level of government nurses at SG 10. Following the said Joint Resolution, former president Gloria Macapagal-Arroyo issued Executive Order No. 811, which further modified the salary grade of entry level nurses from SG 10 to SG 11. “Absent a new legislative measure, there is no basis to grant entry-level nurses Salary Grade 15. Therefore the government cannot be compelled by way of mandamus to grant the salary grade prayed for," Calida said. Calida further argued that giving in to the nurses’ request would only lead to wage distortion in the government medical professionals. “All of these allied medical professionals work under essentially the same conditions, but would become differently situated in terms of salary if Section 32 of R.A. No. 9173 would be enforced,” Calida added. The solicitor general went further to question the credibility of Ang Nars’ former representative who filed the petition, Leah Primitiva Samaco-Paquiz, nothing she is is neither a nurse nor an incumbent legislator. Calida asserted that following the doctrine of hierarchy of courts, the petition should have been filed in the lower courts first. Chief Justice Lucas Bersamin ordered the parties to submit their memoranda in 20 days.